Valentine’s Day is here. How did this happen? Is it just me or have we just finished Christmas and New Year? I can’t decide if those holidays were yesterday or a really long time ago. But now here we are on the most romantic day of the year and Ben’s and my first Valentine’s Day as married. Awwww, barf. You thought I was all done sentimentalizing my newlywed status didn’t you? Sorry, we’re almost done with the mushy first year married mile-stones. I promise! Just bear with me through a couple more. Ben and I just started discussing Valentine’s Day plans, but with him in nursing school full time and clinicals on Valentine’s Day proper we’re pushing back the festivities to the weekend, which I suspect most of the population is doing as well. Bravo Valentine’s Day, you are oh so convenient. The celebration will consist of a dinner out somewhere, presumably somewhere we have a gift card too – since Ben’s parents give us giftcards to restaurants so we can go on date nights and step away from the books and computer long enough to interact (imagine that!) and if I’m really lucky Ben might even (GASP!) buy me carnations. Ever the romantic, Ben hates buying flowers because they’re So expensive and they – die. It’s, in his eyes, paying money to watch something die. See, romantic. Carnations on the other hand, he will get me because no matter what it takes a month to kill them. So he’s getting his monies worth out of them and I get flowers, even filler flowers, and stop nagging him about doing something romantic for me. He says “nagging”, I say “encouraging”. Potato, pototo. But even if flowers aren’t his way of showing me he loves me, I can live with that – because he builds me stuff. My wedding gift was a 6 shelf gorgeously dark brown stained bookcase he build with his own two man hands. He’s already been commissioned to build me the rest of the furniture for our future house. Regardless of our differing views of the holiday, romantic or forced-consumer-driven-holiday-contrived-by-card-manufactuers, I am looking forward to another day that I can show my husband that I love him dearly, despite his annoying habit of placing dirty dishes in my just cleaned sink, and be thankful that he puts up with my equally annoying habit of throwing a pile of clothes at the end of the bed that Huck lays on and gets all hairy. Or having five stacks of cook books strategically placed around the house. Or Downton Abbey replaying on an endless loop in the house. Bless that man and his unending patience. I am beyond thankful for his patience, his drysense of humor that still catches me off guard, getting me hooked on the Office despite my STRONGEST objections to its awkwardness as we were dating, and him having hugs that can make the worst of days suddenly turn around and for putting up with Huck no matter how ridiculous the mutt is. One Valentine’s Day down and 60 more to go. I love you hunny. Really, really. Now – for the reason you’re all here – mushy crap aside – THE CAKE!! It’s UBER Romantic. It’s got fresh strawberries and champagne in it, which just screams Awwwww!!! 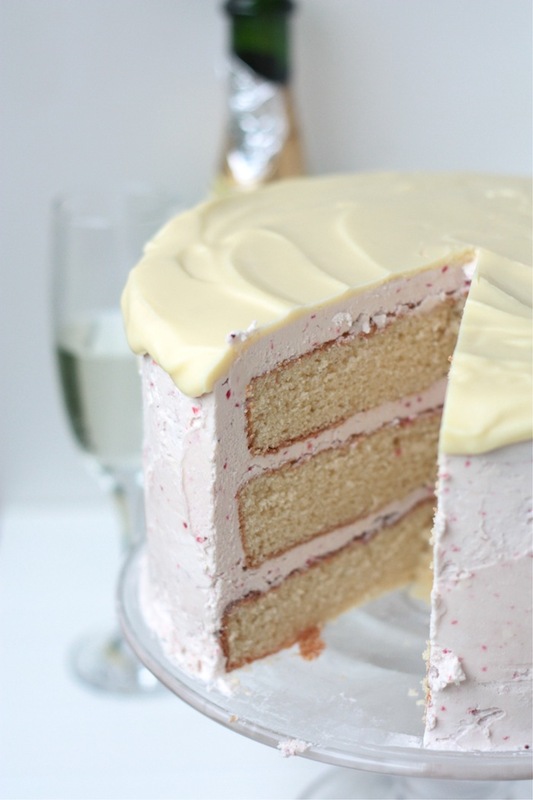 The cake is dense but tender, with champagne that cuts the sweet and a swiss meringue frosting that is chock FULL of butter – but is uber light and fluffy, positively MELTS in your mouth. I would love to say the the fresh strawberries make it healthy, but that would be an outlandish lie. I guess that just means you have to make it for yourself this Valentine’s Day and find out! No, do it now – Because, I’m not kidding – this is Roll Your Eyes into the Back of your SKULL insanely amazeballs. I would highly suggest you share this with EVERYONE you know, and spread the love and butter (SO MUCH BUTTER) this Valentine’s Day. They will love you right back. Adjust oven rack to middle position and heat oven to 340 degrees. Grease three 9” round cake pans and line bottoms with parchment paper. Whisk flour, baking powder, baking soda, salt and 2 1/2 cups sugar together in large bowl. In mixing bowl whisk together melted butter, champagne, oil, vanilla, and yolks. In clean bowl of stand mixer fitted with whisk attachment, beat egg whites at medium-high speed until foamy, about 30 seconds, gradually adding in remaining sugar; continue to beat until stiff peaks just form. Transfer to a separate bowl and set aside. Add flour mixture to now empty mixing bowl fitted with whisk attachment. Gradually add in butter mixture and mix until just incorporated. Stop mixer and scrape whisk and sides of bowl. Return mixer to medium-low speed and beat until smooth and fully incorporated. Fold the egg whites into the batter, pour into cake pans and bake for approximately 35 minutes or until a toothpick comes out clean. Let cake rest in cake tins for 10 minutes before turning out onto a wire cooling rack. Cool Completely before frosting. When cool, level tops of cake with sharp knife and discard cake cuttings. Set aside until ready to decorate. Place three to four strawberries into food processor and puree, set aside ¼-⅓ cup of Strawberry puree. Wipe the mixer bowl and attachments with lemon or vinegar to make sure they are all completely clear of any residual grease. Add egg whites and sugar to mixing bowl, and place it over a sauce pan of simmering water. Whisk constantly but gently, until temperature reaches 160°F, or until the sugar is totally dissolved and the eggs are hot. With whisk attachment of mixer, begin to whip until the meringue is thick, glossy, and the bottom of the bowl feels nearly room temperature. *Don't begin adding butter until the bottom of the bowl feels neutral, and not warm. Switch over to paddle attachment and add butter one cube at a time until all has been added and is incorporated. and mix until it becomes smooth. If mixture is too soft and runny, place in refrigerator for about 15 minutes and continue mixing with paddle attachment until it comes together. Add vanilla and salt, continuing to beat on low speed until well combined. Add strawberry puree and beat until evenly incorporated. Add small amount of pink food colouring, if desired. Level cakes and invert one cake layer on cake plate so that the bottom of the cake is the top. Dollop frosting onto it and spread evenly. Repeat with other two layers. Frost top layer and smooth. Frost sides of the cake. Melt chocolate and butter in microwave safe bowl until just beginning to melt. Stir until smooth. 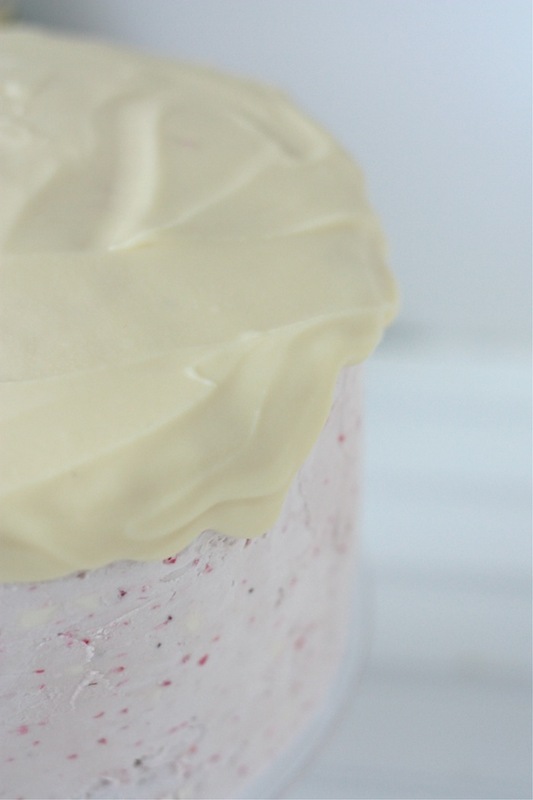 Pour over frosted cake and smooth until it falls over the sides of the cake. Let cool. Slice and devour. This cake!!! OMG this cake!!! My husband LOVES strawberries, I’m totally pinning this and making it. Yours is just gorgeous. Desserts with champagne is my favorite thing ever!!! This is beautiful! 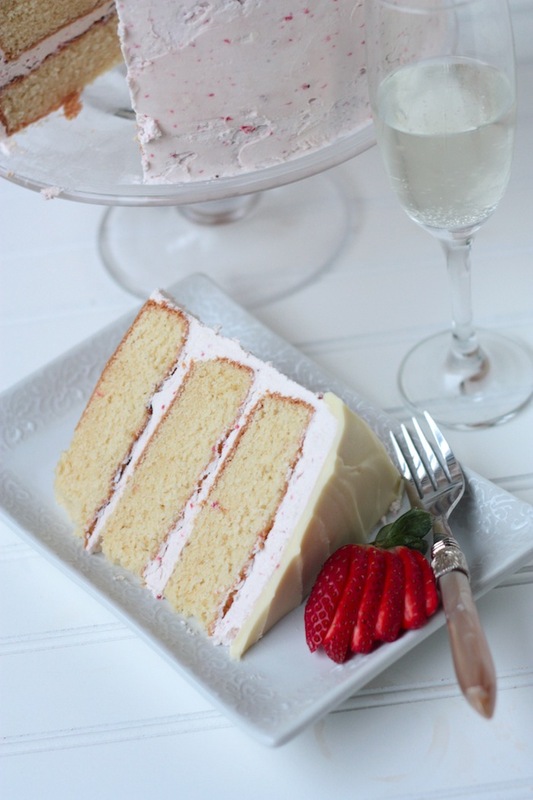 What could be more perfect; strawberries, champagne……Maybe eating this while taking a bubble bath? Ohmahgoodness, this sounds like magic. Tasty, tasty, magic. This looks SO yummy, Megan! This cake is insane, Megan. And I mean that in the best way possible. It’s just so picture perfect! dear lord, i need a piece of this now! so beautiful. i can never get my strawberry garnishes to look like that. It’s so pretty I almost don’t want to eat it! I think that’s the most beautiful cake I have ever seen. mmm perfect for v-day! This is beyond amazing, girl. Very well-done. I would definitely eat a slice for breakfast! Oh wow, this cake looks amazing – I could soooo go for a slice right now! And I love your use of “his own two man hands.” HA! I think you’re allowed to gush about your husband for at least the first 2 years, no? Especially if he’s handy with wood and stain (….er….that’s what she said) Ok, this is going south, quickly. Also? Pass me a fork! This is one of the most amazing cakes ever!! So pretty! Gurrrrl this sounds amazing! You totally had me at champagne! LOVE THIS! What is the best champagne to use? Hi Misty – I just used Cook’s Brut for this. Any champagne will do just fine. I’m just cheap and went for the $6 bottle. Strawberry cake in my face! And it’s pretty too – big bonus! 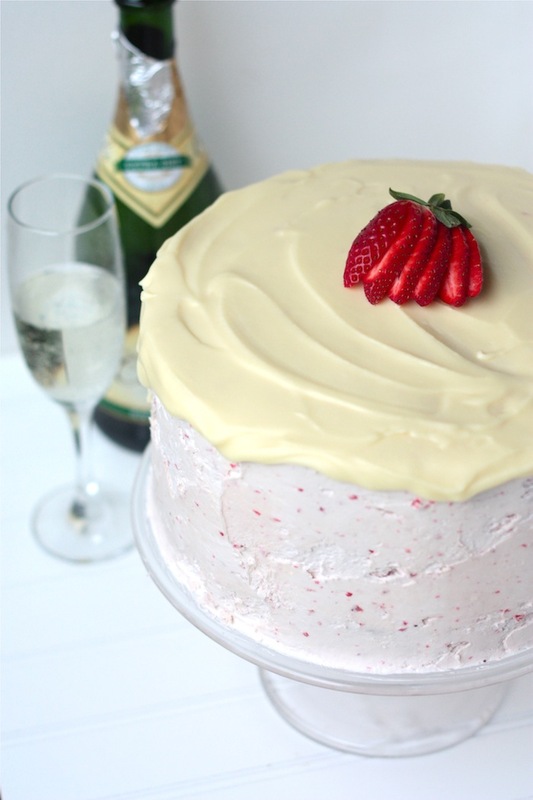 You can’t go wrong with anything that has strawberries and champagne in it! I am dying to make this 🙂 I only have a basic standing mixer though, is it still possible to make this without the whisk and paddle attachments? 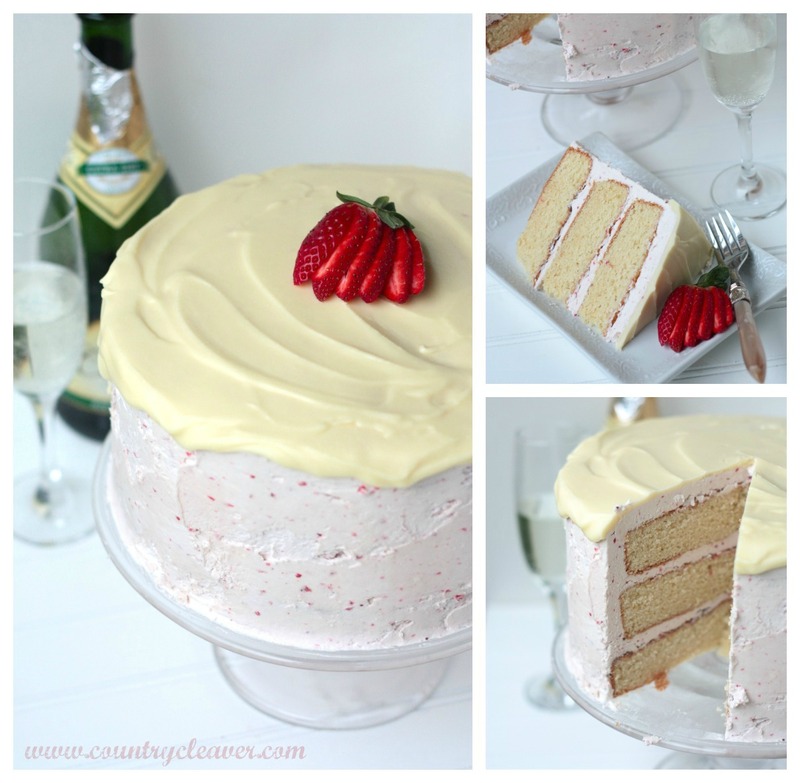 I love anything strawberry flavored, but a strawberries and champagne cake? Could it get any better! I can’t wait to try this. If only I had an excuse to make cake all the time. 🙂 Beautiful cake by the way! This cake is absolutely gorgeous, Megan!!! I think you just won best wife award! This cake is gorgeous and I bet it taste pretty damn good too. 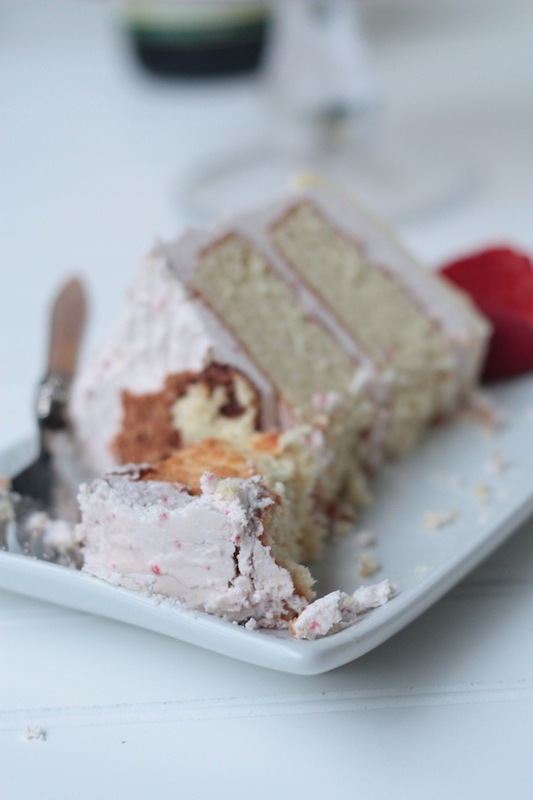 Everything about this cake is amazing and it’s perfect for Valentine’s Day. I particularly like the fact that you’ve combined the frosting and the ganache. One just never seems enough!!! I just want to stuff my face in this cake! Well done – in texture, color, frosting – you name it. Well, I’m sure Ben has his own way in showing his TLC to you. 🙂 And in case you’re bored on Val’s day, I’d be more than happy to accompany you (yeah, hubs is busy working due to busy season at work). Such a beautiful cake, almost too pretty to eat! Oh my mercy! This is my kind of cake! You know you knocked this one plum outta the park! This cake looks amazing!! Love the white chocolate ganache to top it all off! EEK! 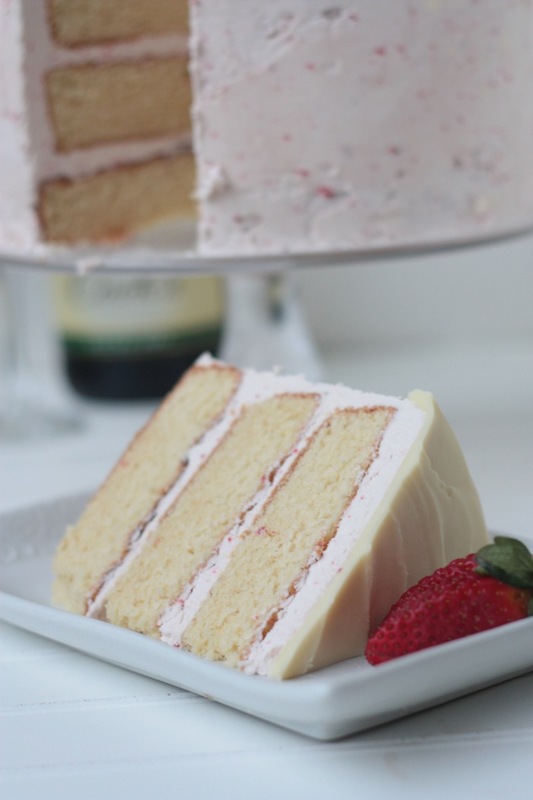 You KNOW how I feel about a gorgeous layer cake!! LOVE! Such a very beautiful cake! I can’t tell you how beautiful this looks. And it sounds absolutely delicious! Lovely, Megan. This cake is stunning! And your baking skills are just out of this world. Holy smokes! This cake is absolutely stunning! This is so purty!! The frosting sounds magical! Now this is one special cake!!! Lovely flavors and presentation 🙂 Pinned a few times. WOW, what a cake! This is a spectacular creation Megan! Duuuude. This cake is kinda sorta freaking GORGEOUS. I almost wouldn’t want to eat it. But then I’d remember it’s cake and I’d be like, stuffing my face with it and not in a pretty way, either. 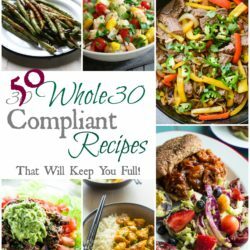 What brand of Champagne did you use in this recipe and how do you flattened it. 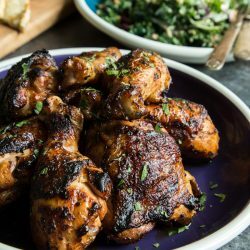 Hi Jackie – I just used a cheap bottle of Cook’s for this recipe. 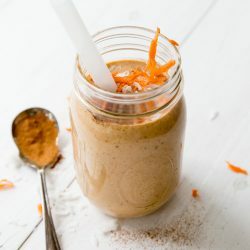 And you can flatten it by pouring it into a glass and letting it sit out for a couple of hours – or I sped up the process by stirring it with a fork for a little while and then letting it rest. It’s just like letting a soda go flat. It takes a little while, but the flavor will remain. I’m thinking I’ll make this cake in cupcake form to take to a party this weekend. Except I’ll probably put the white chocolate under the frosting so I can make a big grand swirl on top. Can’t wait! Hi! I wanted to make this for my mom’s birthday… Do you think it would be good if i used semi sweet chocolate ganache instead of white? I’m sure it would be lovely with semi sweet chocolate!! What kind of white chocolate did you use? Gretta, I used Ghiradelli White chocolate for this. But any white chocolate brand will do. HELP! I worked so hard on this and my icing was super runny. I put it in the fridge and it thickened up. Then I added the butter one by one and then the purée made it even more runny. What can I do? I just made this cake tonight for my daughter’s 21st birthday and I would like to know what the trick is to get it to look like it does in these pictures. This cake is so dense and basically inedible. The frosting is runny and won’t stay on the cake. And I didn’t even try to put ganache on top. This cake was a disaster on every level. Good luck to anyone else who tries it. I’d love to see other reviews. I’m sorry the cake didn’t meet your expectations. I hope you will find other recipes to try and hopefully they will pass muster with flying colors. I will take this recipe back to the drawing board and see where improvements can be made. I will amend my review to say that the cake was good (not inedible as I previously stated) but difficult. The frosting was impossible. I’m glad I tried it. Thank you for the recipe. And thank you for your gracious response to my angry outburst. 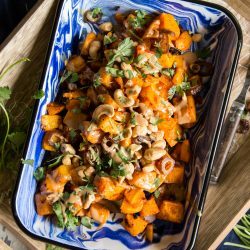 Recipe looks delicious, I will make it for New Year’s Eve! However, I don’t live in the States, how many ounces of white chocolate is used? It is not understood how many ounces in “squares”. Hi Lynda, Each square is approximately 2 ounces. I hope that helps! And happy new year!